A slight downside is that the book has been digitised as plain images i.e. without any word-searchability, which is a great shame. it is to be hoped that the BFI can revisit the digitisation with fresh software to make the ebook all the more useful to researchers – and to do the same for any other silent era books is has in the pipeline. However the individual section are bookmarked in the PDF, which is a help. The Kinematograph Year Book 1914 is available in PDF format, size 30MB, and has been lovingly placed in the Bioscope Library. 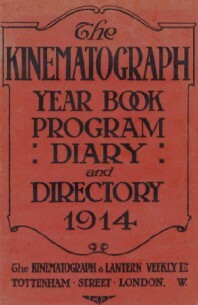 It is possible to download the Kinematograph Year Book as a pdf file and apply OCR to the document using Acrobat. Maybe the Bioscope Library is willing to make the Year Book available to the masses, text recognition included. Thank you anonymous friend – that works perfectly. Great news! I hope they do some early distributors’ catalogues as well. That might save me a few trips to London.